“It’s a strange world of language in which skating on thin ice can get you into hot water” – Franklin P Jones. The English language is complicated. There is a vast vocabulary, loads of grammar rules (most of which have multiple exceptions) and even when you understand a word, its meaning often changes depending on the context. It’s hardly surprising that language comprehension is an area that so many children struggle with. In fact, the more I think about it, the more amazed I am that so many children don’t struggle with it. It’s a minefield! Comprehension problems can be the tricky ones to spot. If a child has unclear speech, this is immediately obvious when they talk. Likewise, if they have severely restricted expressive language, it is usually clear that this is the problem, as they find it hard to put sentences together or they use very few words. Comprehension problems, on the other hand, are harder to spot, as it’s all about what’s going on in someone’s head. You sometimes have to be a bit of a detective to realise that it is the understanding of the language that is the difficulty! The child who seems not to be listening in the classroom and is just messing around can sometimes be doing that because he doesn’t understand. A child who doesn’t answer questions but just talks around a topic may not understand exactly what she’s being asked. Another child may just tune out and be staring out of the window or doing his own thing, because he doesn’t understand what’s happening. Some of these children actually use language very well, so it can be tricky working out exactly what is happening. Once you have identified the problem however, what do you do about it? Every child is different and different things will help. However, here are nine principles to bear in mind when trying to help a child who has difficulty understanding language. When understanding is hard work, it’s natural to stop listening. I remember visiting a friend in Germany. With my GCSE German, I understood enough to get the topic of conversation a lot of the time, but actually following every word was impossible. After a while, I found it too tiring to try and follow the conversation any more and just tuned out. 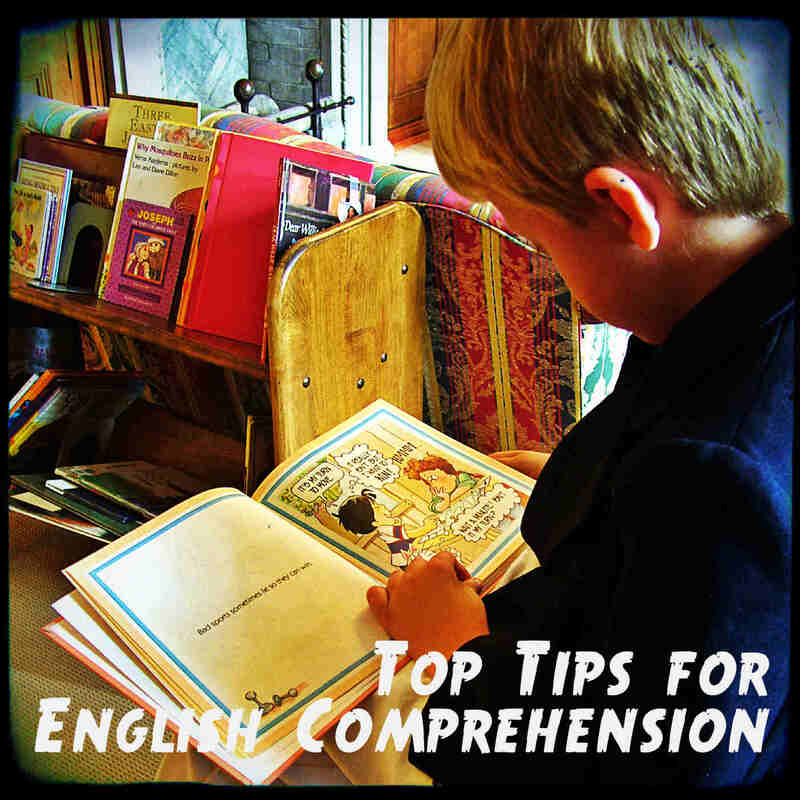 Children with comprehension difficulties often do the same in a classroom or a busy family situation. Say the child’s name and take time to get their full attention before you try to help with the misunderstanding. Often it can be the vocabulary which is problematic for children to understand. Try using a different word. EG if the child is confused by having to “estimate” something, try saying “guess”. If they are not sure what “miserable” means, try “sad”. Be aware that, as I said at the beginning, understanding a word in one context does not necessarily mean that you will always understand it when you hear it. Even if you think the child knows what the word means, try using a simpler one. Short sentences are usually easier to understand than longer ones. Cut one long sentence down into 2 or 3 short ones, with pauses between each one. Stick to the main point. Realistically, if a child has very significant comprehension difficulties they are probably not going to follow every word of every conversation to begin with. Pick out the key points that you really need the child to understand and work on how you can communicate those clearly. Trying to explain too many things all at once is confusing. Show the child. Demonstrate. Use photos and pictures. Use gesture. This is really important and often helps so much. Often children with language difficulties have much better ability to understand visual information. Many of the children I work with are much better at jigsaws and memory pairs than I am! They usually remember things we have done, games we have played, pictures they have seen before etc. even though they may not remember the words we used. Use strengths to help the weaknesses. Use as many different channels to communicate as you can, and encourage the child to do the same. You can find out more about using visual support here. Relate new words and concepts to information the child already knows. We all learn best like this. If someone was trying to explain to me how my car works, it probably wouldn’t help me to start talking about the inner workings of the engine. It definitely wouldn’t help if they assumed that I know what words I hear in garages such as “alternator” and “spark plugs” are and what they do! They would need to start by working out what I do understand (eg how to drive my car) and link the information in from there, a little bit at a time. Children are just the same. Don’t assume you know what a child understands – check it out and then start from there. Keep linking back to things they already understand and have experienced. Ask the child to explain what they have understood. We’ve already identified that question words can be particularly tricky, so just ask an open question such as “what do you need to do?” or “What did your dad say?” Listening to what the child says can often help to identify where the breakdown has occurred and which bit needs some extra help. They may have understood 80% of what was said but misunderstood one vital bit. Make sure you’re explaining the right bit! Sometimes we can be so intent on explaining something to the child in lots of different ways that we just talk too much and inadvertently confuse them more. It’s easily done – I frequently catch myself doing it in my haste to try and help! Pause and give yourself (and the child) time to think. Say one thing and then wait before saying more. Give one instruction at a time. With an older child, ask them if they are ready, or teach them to give a signal that they are ready for more. just read it and as the dad of a daughter who has no speech but plenty of communication methods then this article is so thought provoking.